The Glass Menagerie by Tennessee Williams premiered in 1944 and catapulted Williams from obscurity to fame. The play has strong autobiographical elements, featuring characters based on its author, his histrionic mother, and his mentally fragile sister Laura. In writing the play, Williams drew on an earlier short story, as well as a screenplay he had written under the title of The Gentleman Caller. It opened in Chicago in 1944 to excellent reviews, and during its initial Broadway run, won the New York Drama Critics' Circle Award in 1945. The Glass Menagerie was Williams' first successful play; he went on to become one of America's most highly regarded playwrights. 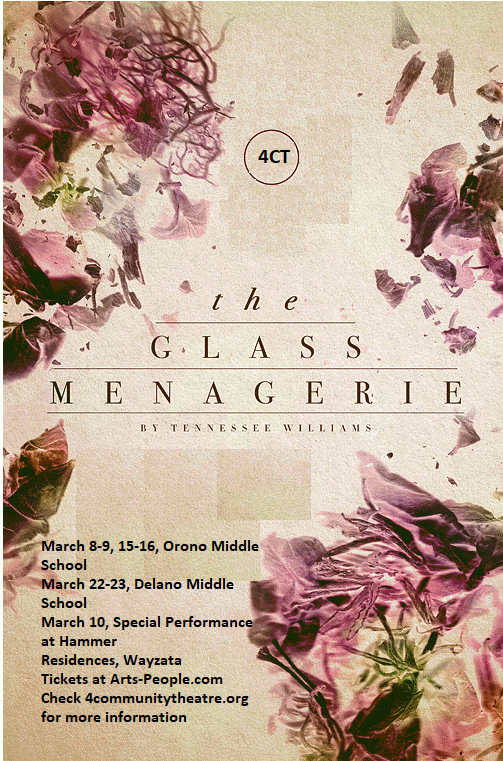 The Glass Menagerie is a "memory play," in which Tom recalls scenes from his youth during the height of the Depression. It shows his mother, Amanda, trying to maintain a lost idyllic southern lifestyle in the midst of overwhelming poverty and cajoling her children into her idea of happiness. Tom’s older, crippled sister, Laura is a shut-in, who resembles her collection of class animals in her delicate inner beauty and fragility. Tom toils in a St. Louis shoe factory to support his struggling family while dreaming of becoming a poet or running away to find adventure. At his mother's insistence, he brings a friend from work home as a possible suitor for Laura. The gentleman caller Jim, went to high school with Laura, and is the only boy that she ever had a crush on. The evening turns into a disaster. After Jim leaves, Amanda scolds Tom, who runs off to join the merchant marine shortly after that disastrous night. As Tom tells the audience in this retold memory, he was never able to leave his guilt behind. So, in the end, none of them escaped from the traps in which they were caught. This production will be presented as a special "sensory adaptive" performance on selected dates, and will play at two venues: Orono Middle School and Delano Middle School over three weekends. This production is presented by arrangement with Dramatists Play Service, and is supported in part by a grant from the Metropolitan Regional Arts Board. Content copyright 2016. 4 Community Theatre. All rights reserved.